Jimmy Carter (formally James Earl Carter, Jr., born 1924) was the 39th President of the United States of America, defeating Republican Gerald Ford in 1976. Carter was a Democrat who served from 1977–1981, after being a one-term Governor of Georgia. At that time, the Georgia Constitution did not permit the Governor to succeed himself. After a failed presidency marked by disasters in the economy and foreign affairs, and poor leadership, Carter was defeated by a landslide for re-election in 1980 by Ronald Reagan, as the nation moved sharply more conservative. Coming out of nowhere in 1976, Carter promised a restoration of honesty to Washington after Watergate, and built a coalition that included most of the South, thanks to his strong support among blacks and his considerable support (in 1976 only) among fellow white Baptists. Despite his religiously conservative background and claiming to be personally pro-life, Carter spent much of his time as president pushing unsuccessfully for ratification of the Equal Rights Amendment, which would have given federal courts carte blanche to impose taxpayer-funded abortion. In an interview with the Huffington Post in July 2018, Carter claimed that Jesus would approve of homosexual "marriage" and certain abortions. In an October 2000 survey of 132 prominent professors of history, law, and political science, Carter's presidency was rated in the "Below Average" group; he ranked 30th, with a mean score of 2.47 out of 5.00. This survey, sponsored by the Wall Street Journal and the conservative Federalist Society, ranked Carter ahead of Richard Nixon, and below George H.W. Bush. Carter has been unusually active as an ex-president, serving as an election monitor in many emerging democracies, working with Habitat for Humanity, and as a self-proclaimed "peace advocate", was recognized with the Nobel Peace Prize. Carter considers his accomplishments in his post-presidency as "superior" to his fellow office-holders. His criticisms of Israel have been controversial. Carter was born and raised on his father's farm in Georgia. He entered the Naval Academy at Annapolis and graduated from there in 1946. Shortly afterwards, on July 7, he married Rosalynn Smith. Carter worked in submarines, attaining the rank of lieutenant, until he resigned in 1953. He became a peanut farmer afterwards. Carter entered politics by running for the Georgia State Senate. He almost lost a close race against Homer Moore, but Carter beat him in the final tally. In 1966 Carter unsuccessfully sought the Democrat nomination for Governor of Georgia. This failure significantly affected Carter personally by influencing him to turn to religion for comfort, convincing him that he had been "born again." Carter did succeed in his second bid for Governor in 1970. Racism was a major factor in his campaign, in which he criticized his primary challenger Carl Sanders for paying tribute to Martin Luther King, Jr., in an effort to depress Sanders's white vote. Carter said "I have no trouble pitching for [George] Wallace votes and black votes at the same time, I can win this election without a single black vote." Carter was elected governor, with almost no African American support. For the next four years he presided over state affairs. He presented himself as a populist, the representative of the people as opposed to special interests. Carter emphasized welfare reform, educational advance and budget reform. Once pro-life, he changed his position and supported the legalization of abortion and worked to replace capital punishment in Georgia with life in prison. In 1974, the Georgia Constitution prohibited the Governor from seeking a consecutive term, and Carter was succeeded by Joe Frank Harris. The Georgia Constitution was amended in 1976 to permit the Governor to serve two consecutive terms, and Harris was re-elected in 1978. Later in life Jimmy Carter declared himself to be against abortion. For a more detailed treatment, see United States presidential election, 1976. Carter had decided well before his term as Governor ended to run for the Presidency in 1976. His campaign, which began in early 1975, stressed Washington's defects such as the Watergate affair in 1974. He campaigned on a widespread call for change. In the Democrat primary, Carter was able to defeat George Wallace in the southern primaries and established himself as a person who could win the south and reestablish Democrat control of the White House. He won the primary because of his inspiring and well organized campaign. Running against President Gerald Ford in the general election, Carter had little experience in national politics, however he used that to his benefit by promising to restore honesty and morality to government. On election day, Carter edged out Ford with 50 percent of the vote to 48 percent. Carter's running mate, Walter Mondale, met with Jim Jones during the campaign. Jones was one of the few people invited aboard his chartered jet for a private visit. Mondale stated regarding the Peoples Temple that "knowing the congregations deep involvement in the major social and constitutional issues of our country . . . is a great inspiration to me." On taking office Carter proposed radical energy programs, redistributive tax reform, public campaign financing, a consumer protection agency (that Ralph Nader had long championed), labor law reform, and enactment of the Equal Rights Amendment. He fought with fellow Democrats in Congress and achieved little or nothing. Meanwhile, "stagflation" hit the economy hard, as energy shortages, slow growth, escalating inflation and very high interest rates sapped the economy. It was worse in foreign affairs. Carter did broker a temporary peace in the Middle East, but was forced to abandon détente when the Russians began to exploit American weaknesses around the globe. Carter was forced to restart the Cold War when the Soviets invaded Afghanistan in 1979, but his belated actions validated the complaints of conservatives that he offered too little too late. Meanwhile, the nation was humiliated in Iran, where militants held American diplomats captive for 444 days, while Carter proved helpless. Carter was elected by campaigning on the Misery Index - adding the inflation rate and unemployment rate together, which stood at 13.4%. By 1980 the Misery index stood at 21%. By 1992, after "twelve years of neglect," the Misery Index stood at 9.2%. President Carter during White House Press Conference. Carter inherited a recession when taking office. First he tried to reduce unemployment by both increasing government spending and cutting taxes. However, when inflation skyrocketed in 1978 he changed his mind. He delayed tax cuts and vetoed the spending programs that he himself proposed to the Congress. Carter then tried to ease inflation by reducing money supply and raising interest rates. All of his efforts proved to be unsuccessful. Inflation and interest rates soon reached their highest levels since World War II. The rapid change in interest rates led to disintermediation of bank deposits, which sowed the seeds of the Savings and Loan crisis. Investments in fixed income were becoming less valuable. Holders of both bonds, and pensions being paid to retired people had their life savings wiped out. The stagnant growth of the economy (causing unemployment), in combination with a high rate of inflation, has often been called stagflation, an unprecedented situation in American economics. By 1979, public opinion polls had Carter's popularity lower than Richard Nixon's during Watergate, partly because of his inexperience and difficulties working with Congress. 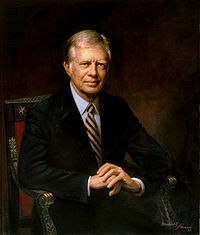 Carter proposed a national energy program to conserve oil and promote the use of coal and renewable energy sources. He also persuaded Congress to create the Department of Energy, and asked Americans to personally reduce their energy consumption. Although oil companies were insisting on deregulation of the energy industry, Carter advocated a "windfall profits tax" to prevent oil companies from overcharging consumers. Carter's plan did not solve the country's energy crisis. In the summer of 1979 a major oil shortage in the United States took place because of instability in the middle east. After increasing pressure to act, Carter gave several televised address' where he complained that there was a "crisis of confidence that had struck at the very heart and soul of our national will." Although Carter meant the speech to be a timely warning, many Americans interpreted it as President Carter blaming the public for his failures. Critics dubbed it Carter's "malaise speech." In contrast to Carter's economic policies which were uncertain and left the public confused, his foreign policy was more clearly defined, although foreign policy is where Jimmy Carter suffered his worst defeats. In his inaugural speech he stated that "our commitment to human rights must be absolute." He singled out the Soviet Union as a violator of human rights and strongly condemned the country for arresting its citizens for political protests. However, he was criticized for not doing enough to promote his proclaimed human rights foreign policy stance in his administration, such as continuing to support the Indonesian government even while it was implicated in the commission of acts of genocide in the occupation of East Timor. Carter also tried to remove the U.S. image of interventionism by giving Panamanians control of the Panama Canal. Over conservative opposition he did so—but Panama fell into the hands of a dictator who threatened Americans and had to be overthrown by an American invasion in 1989. Détente with the Soviet Union collapsed when Soviet troops invaded Afghanistan in December 1979. President Carter responded by imposing an embargo on the sale of grain to the Soviet Union, humiliating Moscow by orchestrating a western boycott of the 1980 Summer Olympic Games in Moscow, and start funding and arming the anti-Soviet forces inside Afghanistan. The policy of détente that was established by President Nixon was over and the "Second Cold War" began. Carter's greatest and arguably only triumph while in office was a historic peace treaty known as the Camp David Peace Accords, between Israel and Egypt, two nations that had been bitter enemies for decades. Blindfolded American hostages being paraded before the public by their Iranian captors, November 5, 1979. The treaty was formally signed in 1979, with most Middle Eastern countries opposed to it. For a more detailed treatment, see Iran Hostage Crisis. In 1979, a new radical Islamic regime lead by Ayatollah Khomeini in Iran overthrew America's close ally Shah. Thousands of modernizers were arrested, expelled or executed. This had partially been Carter's fault, as in February of that year, when asked whether the Shah would survive the current turmoil, Carter gave an ambiguously worded response stating the following: "I don’t know. I hope so. This is something that is in the hands of the people of Iran. We have never had any intention and don’t have any intention of trying to intercede in the internal political affairs of Iran…. We personally prefer that the Shah maintain a major role in the government, but that’s a decision for the Iranian people to make." This statement ultimately emboldened the radicals due to it essentially communicating that America won't back up its ally. In addition, he also spent a lot of time sabotaging the Shah of Iran's chances due to the latter's anti-Human Rights elements, as "human rights" was a major platform for Carter as well as overall being duped by the Ayatollah Khomeini. In November 1979 student revolutionaries stormed into the American embassy in Tehran and captured 52 United States diplomats as hostages. The US seized all Iranian assets and tried to bargain, a process that dragged on for 444 days. Despite pressure to use military action Carter tried to negotiate with Iran, which proved to be unsuccessful. In April 1980 President Carter approved a rescue attempt (over the opposition of Secretary of State Cyrus Vance). To the nations dismay, the attempt failed when several helicopters malfunctioned. Eight serviceman died in the accident. Carter's negotiations with Iran continued throughout 1980. Ironically, the hostages were released just after Carter left office on January 20, 1981, as they were fearful of what President Reagan might do. By the time of President Carter's reelection campaign, the country was plagued by problems, including high levels of unemployment, inflation, interest rates and the Iranian hostage crisis. Although incumbent Presidents usually win their party's nomination easily, Carter faced a primary challenge from the more liberal Massachusetts Senator Ted Kennedy. Carter was able to maintain a lead over Kennedy and defeated him with 51 percent of the vote to 38 percent. In the general election, Carter faced two opponents: Conservative and charismatic California Governor Ronald Reagan as the Republican nominee and moderate Illinois Congressman John Anderson running as an Independent. Reagan locked the election in late October of the campaign when, at the Presidential debate, he asked the voters, "Are you better off than you were four years ago?" His relaxed performance helped to dispel fears from the Carter camp that Reagan was a war monger. Reagan won by a large margin, 43.9 million votes for Reagan and 35.5 million votes for Carter. Democrats maintained control of the House of Representatives but by a narrower margin, and lost control of the United States Senate. Carter left office disappointed and unhappy. He became the first elected President since Herbert Hoover to lose a bid for a second term. Cover of Jimmy Carter's book, Peace Not Apartheid, which accuses Israel of practicing racism. Our President, Woodrow Wilson, was honored here for promoting the League of Nations, whose two basic concepts were profoundly important: "collective security" and "self-determination." Now they are embedded in international law. Violations of these premises during the last half-century have been tragic failures, as was vividly demonstrated when the Soviet Union attempted to conquer Afghanistan and when Iraq invaded Kuwait. It is imperative that the general Arab community and all significant Palestinian groups make it clear that they will end the suicide bombings and other acts of terrorism when international laws and the ultimate goals of the Roadmap for Peace are accepted by Israel. The sentiment was widely criticized. He apologized for the wording of that sentence, but not for his larger message. His 2006 book, "Palestine: Peace Not Apartheid," caused a top aide to resign. Professor Kenneth Stein resigned from the Carter Center because of its depiction of Israel through three decades of diplomatic and military dealings with the Palestinians. Mr. Stein had served as an aide to Mr. Carter during most of those years and considers the book deceitful and malicious. As the book's title suggests, Carter compares Israel with the white supremacist regime of old South Africa. Fourteen members of the Carter Center's advisory board have resigned over the book. In September 2009, Carter caused controversy when he stated that conservative criticisms of Barack Obama are due to racism. As President, Carter expressed a goal of making government "competent and compassionate." In pursuit of that vision, he has been involved in a variety of national and international public policy, conflict resolution, human rights and charitable causes. He founded The Carter Center in 1982 which has the goal of alleviating human suffering. The Center promotes democratic elections and has programmes to improve health in developing countries through the control of parasitic diseases such as Guinea Worm. It is fair to say that ex-President Carter is probably much more respected outside the United States than in his home country. Carter reported seeing an unidentified flying object UFO in 1969. He later recalled, "A light appeared and disappeared in the sky . . . I think the light was beckoning me to run in the California primary." Astronomers generally concur that he actually saw the planet Venus. Bourne, Peter G. Jimmy Carter: A Comprehensive Biography from Plains to Post-Presidency (1997). Hargrove, Erwin C. Jimmy Carter as President: Leadership and the Politics of the Public Good (1988). Morris, Kenneth E. Jimmy Carter, American Moralist (1996). Aronoff, Yael S., "In Like a Lamb, Out Like a Lion: The Political Conversion of Jimmy Carter," Political Science Quarterly, 121 (Fall 2006), 425–49. Skidmore, David. Reversing Course: Carter's Foreign Policy, Domestic Politics, and the Failure of Reform (1996). ↑ Williams, Thomas D. (July 9, 2018). Jimmy Carter: Jesus Would ‘Approve’ of Gay Marriage, Some Abortions. Breitbart News. Retrieved July 9, 2018. ↑ Chasmar, Jessica (July 9, 2018). Jimmy Carter: 'I believe that Jesus would approve of gay marriage,' some abortions. The Washington Times. Retrieved July 9, 2018. ↑ Bohon, Dave (July 12, 2018). Jimmy Carter Sounds Off on Jesus, Gay Marriage, Abortion. The New American. Retrieved July 12, 2018. ↑ Jimmy Carter: I'm A Superior Ex-President, CBS.com , September 20, 2010. ↑ Obama, Racism, and Jimy Carter, By Jeff Stein, CQ Politics, 9/17/2009. ↑ The Roots of the I.Q. Debate, Eugenics and Social Control, By Margaret Quigley, Political Research Associates. ↑ Encyclopedia of Presidents, Jimmy Carter, by Linda R. Wade, Children's Press, Chicago, 1989, pp. 11-33. ↑ When Deputy Minister Ptolemy Reid traveled to Washington, D.C. in September 1977 to sign the Panama Canal Treaties, Mondale asked him, "How's Jim? ", which indicated to Reid that Mondale had a personal interest in Jones' well being, p. 173. ↑ "First Lady Among Cult's References" "First Lady Among Cult's References; Mondale and Califano also listed", Los Angeles Times, November 21, 1978. ↑ Text of Carter's Nobel Lecture Jimmy Carter Library and Museum, 2002. ↑ Val Morgan, et al. Rumor (1984). Jimmy Carter is a liar, Alan Dershowitz, Jerusalem Post, March 13, 2007. Jimmy Carter's Jewish Problem by Deborah Lipstadt. This page has been accessed 177,020 times.